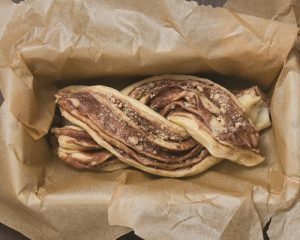 Babka, like rugelach, is a classic Eastern European cake made from a yeasted dough and layers of chocolate or cinnamon filling. In Israeli it is called kranz cake, kranz being German for crown. Until fairly recently, babka was almost a forgotten Jewish dessert. You could buy it in kosher shops or packaged from the gourmet shop Zabar’s in New York City, but it was hardly the star of the dessert spread. 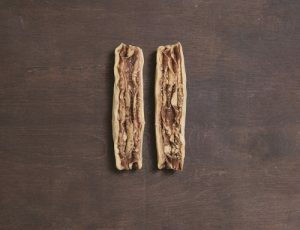 It is only in the past few years, particularly since the emergence of Breads Bakery in New York City, that babka achieved rockstar status. These days babka has taken on a life of its own—coveted by foodies, reinterpreted by chefs and bloggers all over the United States. I have seen every variety of babka from sweet matcha and black sesame babka to savory pulled brisket babka. 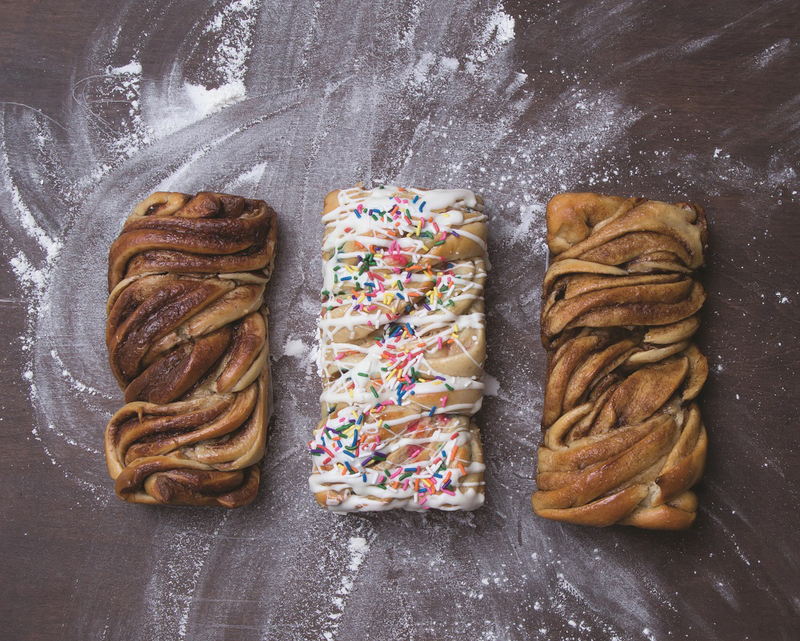 Babka can seem daunting—how do you achieve those swirls? But once you know how simple it is to make, you will be experimenting with sweet and savory flavor combinations of your own. 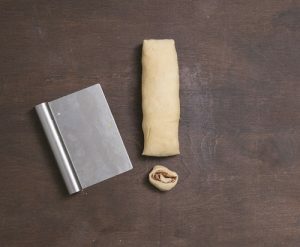 Babka dough will be the lightest of the yeasted doughs in this book. It should be very shiny and elastic with a luxurious texture and sheen. The babka dough should only rise 1 to 2 hours at most. I do not recommend making babka dough ahead of time and allowing to rise in the fridge. The dough recipe will yield 3 medium-sized babkas, or 2 larger babkas. Allow to cool completely before storing in a sealable plastic bag. You can wrap babka in tin foil, then place in freezer bag and store for up to 2 months. Defrost and warm slightly to serve. You can use an unbleached all-purpose flour for babka. You may want to invest in three 8 ½-by-4 ½-inch loaf pans, as this recipe yields three medium babkas. You can also make one loaf and two rounds, or one loaf and one larger round. 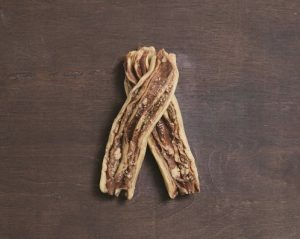 A good dough cutter is necessary for splitting the babka dough to create those coveted swirls. Using your food scale is also useful in babka. When you split the dough between pans, whether in half or thirds, use your food scale to measure the amount of dough. Make sure to have a wooden pastry brush for those babka recipes that call for sugar syrup. I was always intimidated to make babka because of those coveted swirls. But once I bit the bullet and saw how similar babka dough is to challah, I realized the task was far more realistic than I’d thought. This sweet babka dough is more elastic, smoother, and shinier than challah dough. You want to roll it out as thinly as possible on a lightly floured surface to achieve as many of those beautiful and delicious swirls as possible. 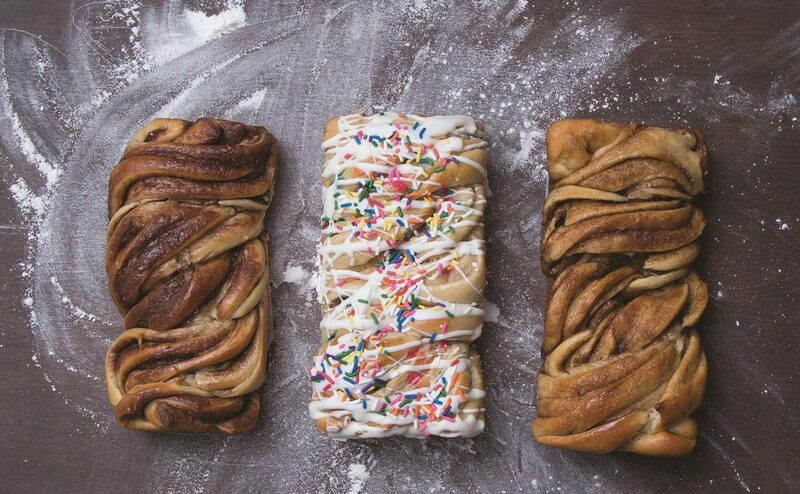 Babka can seem daunting—how do you achieve those swirls? But once you know how simple it is to make, you will be experimenting with sweet and savory flavor combinations of your own. For the dough: Place the yeast and ½ teaspoon sugar in a small bowl. Add the lukewarm water and stir gently to mix. Set aside until foamy, 5 to 10 minutes. In a stand mixer fitted with a dough hook, mix together the flour, ⅓ cup sugar, and 2 teaspoons vanilla. In a medium saucepan, scald the milk (bring almost to a boil, until milk is just simmering). Allow to sit for 1 minute to cool just slightly. With mixer on low, add the water-​yeast mixture, milk, and melted butter. Add the eggs one at a time. When the dough begins to come together, after 2 to 3 minutes, turn off the mixer and scrape down the sides. Raise the speed to hgh and mix for another 5 to 10 minutes until the dough is shiny, elastic, and smooth. It may seem like a long time to mix, but the result is worth the wait. Make the sugar syrup while the dough is rising: Combine the water, sugar, and vanilla in a small saucepan. Bring to a low boil until the sugar has dissolved. Set aside and cool. This syrup can be kept in the fridge for 2 to 3 months and makes enough for at least 2 batches of babka (6 medium babkas). Prepare three 8 ½-by-4 ½-inch greased loaf pans. Note: you can also make two larger round babkas that can be baked on baking sheets. Cut the dough into three equal parts (use a food scale for precision). Roll out one part into a rectangle. 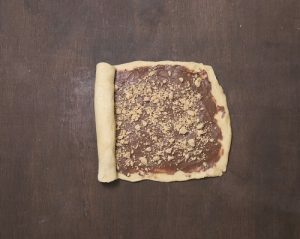 Spread one-third of the filling onto the rectangle and roll up along the shorter side (to create swirls inside). Once the dough is formed into a swirled log, cut it straight down the middle so the filling is exposed. Layer each cut piece on top of one another and twist. Place in a greased loaf pan. Repeat with the other two pieces of babka dough. Lightly drape a kitchen towel over the top of the pans. Allow to rise another 30 minutes. Preheat oven to 3500F while the dough rises. Bake for 20 minutes. Brush each babka with two layers of sugar syrup. Place back in the oven for approximately 15 minutes. The edges should be slightly brown and the middle should be slightly doughy. When the babkas come out of the oven, immediately brush each with another 3 light layers of sugar syrup. Allow to cool for 5 to 10 minutes. Using a butter knife, loosen the sides of the babka from the pan and place on top of wire rack to cool. Used with permission from Modern Jewish Baker: Challah, Babka, Bagels & More by Shannon Sarna, The Countryman Press 2017.